Yesterday I shared some photos from a recent Farmer’s Market excursion. Being the Ultimate Food Geek™ that I am, the Farmer’s Market is pretty much my favorite place in the world. Especially this year – I’ve been eating super healthy and super seasonal, and I can feel it energizing every cell in my body! Food is so magical! And as you know, each week Damian and I choose something special, our ‘ingredient of the week’. Sometimes it’s just something standard that happens to be at the absolute height of its season and thus overflowing with nutrients and irresistible flavors – think blueberries, sugar peas, asparagus, or raspberries! But more often than not we try to select something a bit more unique. Ideally, something we’ve never tried before. As they say, ‘variety is the spice of life‘ . . . and we like or life spicy! So a few weeks back we waded into the waters of that big and burly bush bean, the fava. Neither of us had ever eaten favas, and I certainly hadn’t cooked with them. Not that I’d let something like that stop me! I did what I always do – I asked the farmers. They began sharing their preparation methods with me, and a few other patrons overheard and jumped in with their favorite techniques, and pretty soon we were in the midst of a full on recipe-swapping fava convention. LOVE IT! There were tons of great ideas – favas can be enjoyed in so many ways, including raw – but as soon as I heard the words ‘like a hummus’ I knew what I would be doing. I have a deep and undying love of hummus and any excuse to riff on that template is a happy day in the kitchen as far as I’m concerned. 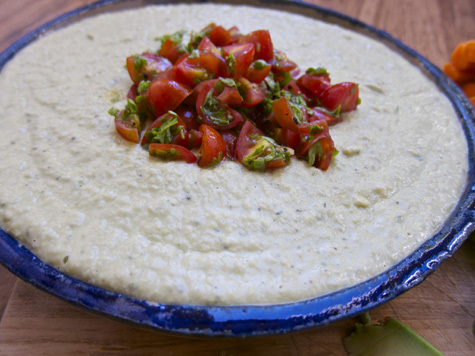 I think dips are an essential warm weather food. A protein-packed dip (like this one) is the perfect dinner for a hot summer night, and it’s a common theme around our house. Simple and seasonal and totally refreshing. Split the pods and remove all beans. 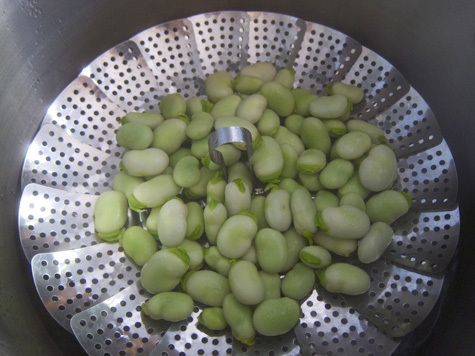 Favas have two layers you have to get through – the outer pod and then a transparent ‘skin’ covering each bean. To get this off you need to steam them. 15 minutes or so should do it. Once they’re cooled you can pop them out of their ‘skin’. In a large pan heat the olive oil over medium. Add the chopped onion and sauté until glassy. Add the garlic and the favas, cook a bit more, then deglaze with a splash of wine. Turn the heat to low and simmer a few more minutes. Transfer the entire contents of the pan to a food processor or blender. Add the lemon juice, olive oil, oregano, and thyme. Blend until smooth. If you need more liquid you can add water or olive oil or lemon juice, whichever your preference. Add salt and pepper to taste. Chill the dip in the fridge before serving. While it’s cooling down, dice the cherry tomatoes and mince the parsley. Mix these along with the olive oil and use as a garnish atop the dish when you serve. 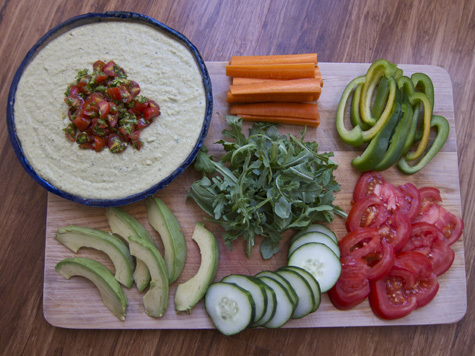 This is great served as a party dip with sliced veggies (my favorite) or organic corn chips (Damian’s favorite). 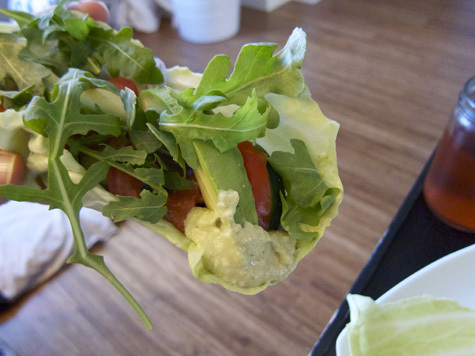 But you can also make it more ‘meal-like’ by wrapping it up in the vessel of your choice. Flat breads are great for a heavier meal, while cabbage leaves are awesome for something lite and refreshing. Top with avocados for absolute deliciousness! It also feels so good to be back on Bonzai Aprhodite, now I’ve got tons of posts to read. So exciting! Keep going with the seasonal and organic eating! I hope I’m able to do the same and it won’t break my wallet. Lots of love from tiny Estonia! I plan on planting a LOT of favas this autumn as a cover crop and will definitely add this recipe to my collection! Yay! I was just talking with someone the other day at New Seasons about fava beans since they keep catching my eye this year. I was told that they weren’t very flavorful and it was suggested that I buy something else. That just made me want them more, but I didn’t know what to do with them. Now I do, thanks! I keep getting bags of fava beans in my CSA and am at a loss about what to do with them! Thank you for the recipe!! 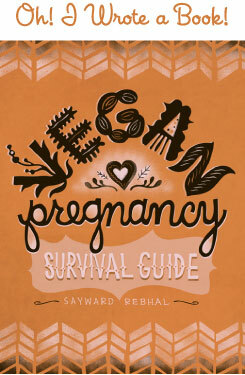 @ windycityvegan – Yay, hope you enjoy it. Let me know when you do end up making it! @ Stephanie – You’re welcome! Let me know how it works out for you! Oh! Perfect timing! 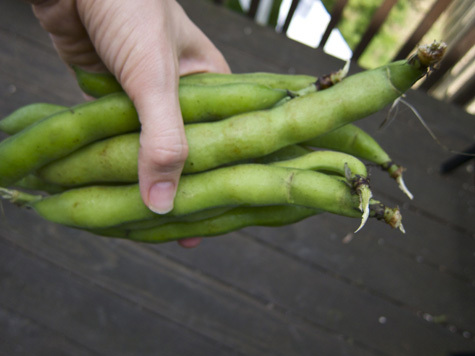 We just received our first batch of fava beans from our local CSA! Thanks for posting this! No way – I never knew how you actually dealt with fava beans. How could it be that a hummus-twin has been hiding in them all along!? Thanks for this! Yay, I’m glad I could help so many people make use of favas! Stephanie, so glad you liked it. Everyone else, let me know if you make and how it turned out!